Abandoned in River’s Bend, Missouri, by the members of an uncharitable wagon train headed west, Maggie Flanaghan finds herself in trouble with nowhere to turn. But in the citizens of the small town, she discovers friends and acceptance upon the death of her dear father—and catches the attention of the town’s most eligible bachelor. When her past threatens to destroy her happiness, she must choose to flee or fight for the sanctuary of a good man’s love. Kristoph Oltmann hadn’t planned on still being alone with no wife and partner to share his life. 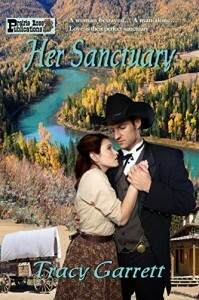 He thought Maggie Flanaghan was the answer to his prayers, but her secret past makes her unsuitable as a preacher’s wife. Can he believe Maggie has been heaven-sent in spite of her predicament? Can he be HER SANCTUARY, even as she is exactly what he longs for—a haven for his heart?